Cheshire venue Peckforton Castle has reported record sales last month following the launch of its new £1.7m facilities. Sales at Peckforton Castle were up 7% in August compared with the same month last year. The highest growth was in conference bookings, which rose almost three times from August 2009. Peckforton Castle managing director Chris Naylor said: "In our business we expect August to be a great month, but these figures are beyond our expectations and forecasts. 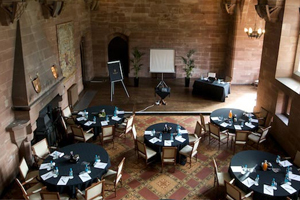 The growth in the conference market is testament to our success in widening the appeal of Peckforton Castle." The new £1.7m facilities opened in July and include 10 luxury en-suite bedrooms, the 2010 Brasserie and spa facility Tranquility. The venue has five conference and meeting rooms for up to a total of 500 delegates. The largest suite, The Great Hall, can hold 180 theatre-style.